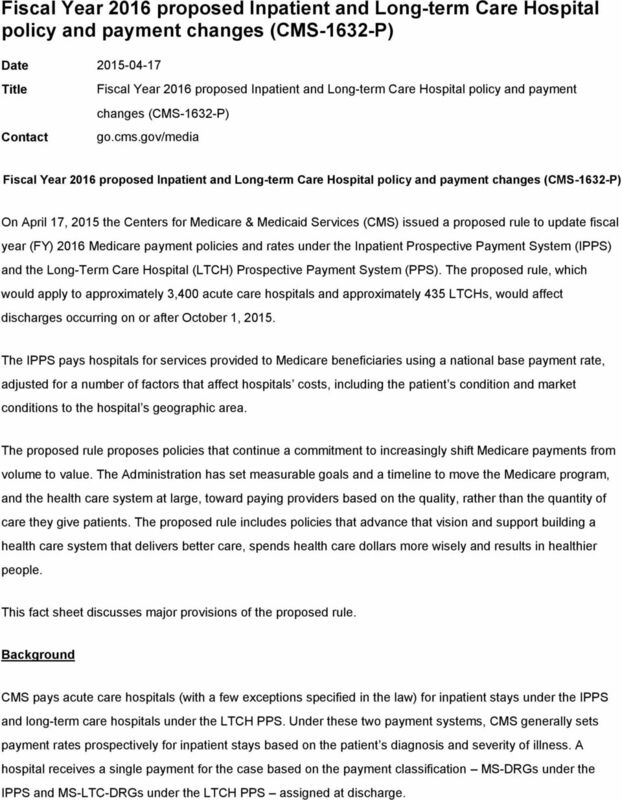 Download "Fiscal Year 2016 proposed Inpatient and Long-term Care Hospital policy and payment changes (CMS-1632-P)"
1 Fiscal Year 2016 proposed Inpatient and Long-term Care Hospital policy and payment changes (CMS-1632-P) Date Title Fiscal Year 2016 proposed Inpatient and Long-term Care Hospital policy and payment changes (CMS-1632-P) Contact go.cms.gov/media Fiscal Year 2016 proposed Inpatient and Long-term Care Hospital policy and payment changes (CMS-1632-P) On April 17, 2015 the Centers for Medicare & Medicaid Services (CMS) issued a proposed rule to update fiscal year (FY) 2016 Medicare payment policies and rates under the Inpatient Prospective Payment System (IPPS) and the Long-Term Care Hospital (LTCH) Prospective Payment System (PPS). The proposed rule, which would apply to approximately 3,400 acute care hospitals and approximately 435 LTCHs, would affect discharges occurring on or after October 1, The IPPS pays hospitals for services provided to Medicare beneficiaries using a national base payment rate, adjusted for a number of factors that affect hospitals costs, including the patient s condition and market conditions to the hospital s geographic area. The proposed rule proposes policies that continue a commitment to increasingly shift Medicare payments from volume to value. The Administration has set measurable goals and a timeline to move the Medicare program, and the health care system at large, toward paying providers based on the quality, rather than the quantity of care they give patients. The proposed rule includes policies that advance that vision and support building a health care system that delivers better care, spends health care dollars more wisely and results in healthier people. This fact sheet discusses major provisions of the proposed rule. Background CMS pays acute care hospitals (with a few exceptions specified in the law) for inpatient stays under the IPPS and long-term care hospitals under the LTCH PPS. Under these two payment systems, CMS generally sets payment rates prospectively for inpatient stays based on the patient s diagnosis and severity of illness. A hospital receives a single payment for the case based on the payment classification MS-DRGs under the IPPS and MS-LTC-DRGs under the LTCH PPS assigned at discharge. 2 By law, CMS is required to update payment rates for IPPS hospitals annually, and to account for changes in the costs of goods and services used by these hospitals in treating Medicare patients, as well as for other factors. This is known as the hospital market basket. LTCHs are paid according to a separate market basket based on LTCH-specific goods and services. 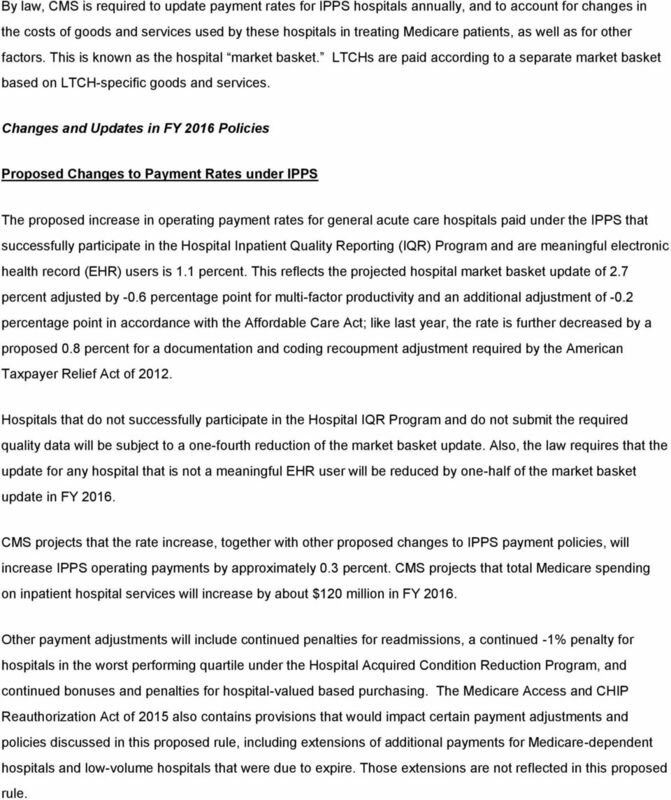 Changes and Updates in FY 2016 Policies Proposed Changes to Payment Rates under IPPS The proposed increase in operating payment rates for general acute care hospitals paid under the IPPS that successfully participate in the Hospital Inpatient Quality Reporting (IQR) Program and are meaningful electronic health record (EHR) users is 1.1 percent. This reflects the projected hospital market basket update of 2.7 percent adjusted by -0.6 percentage point for multi-factor productivity and an additional adjustment of -0.2 percentage point in accordance with the Affordable Care Act; like last year, the rate is further decreased by a proposed 0.8 percent for a documentation and coding recoupment adjustment required by the American Taxpayer Relief Act of Hospitals that do not successfully participate in the Hospital IQR Program and do not submit the required quality data will be subject to a one-fourth reduction of the market basket update. 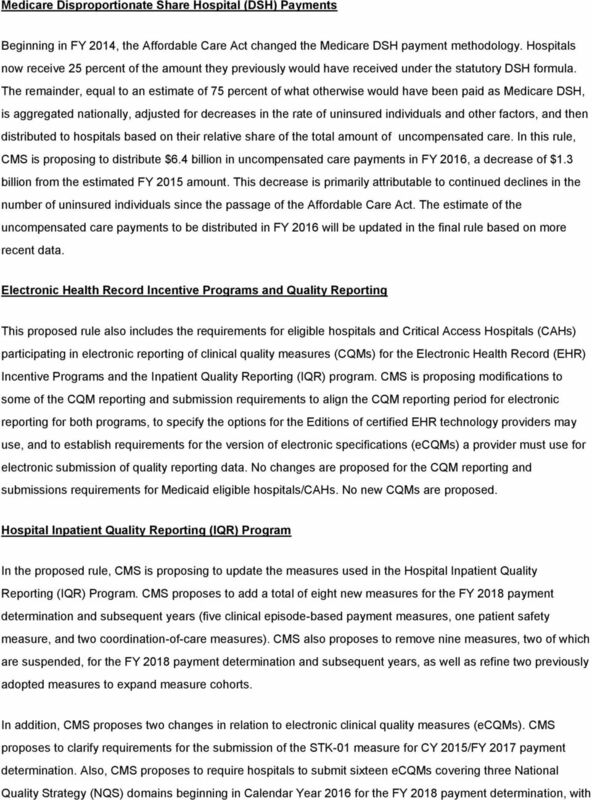 Also, the law requires that the update for any hospital that is not a meaningful EHR user will be reduced by one-half of the market basket update in FY CMS projects that the rate increase, together with other proposed changes to IPPS payment policies, will increase IPPS operating payments by approximately 0.3 percent. CMS projects that total Medicare spending on inpatient hospital services will increase by about $120 million in FY Other payment adjustments will include continued penalties for readmissions, a continued -1% penalty for hospitals in the worst performing quartile under the Hospital Acquired Condition Reduction Program, and continued bonuses and penalties for hospital-valued based purchasing. The Medicare Access and CHIP Reauthorization Act of 2015 also contains provisions that would impact certain payment adjustments and policies discussed in this proposed rule, including extensions of additional payments for Medicare-dependent hospitals and low-volume hospitals that were due to expire. Those extensions are not reflected in this proposed rule. 3 Potential Expansion of Bundled Payments for Care Improvement Initiative In 2011, CMS launched the Bundled Payments for Care Improvement (BPCI) initiative. The BPCI initiative links payments for multiple services during an episode of care into a bundled payment. BPCI episodes initiate either with an inpatient stay or with post-acute services following a qualifying inpatient stay. CMS is continuing to implement the initiative, which is testing four models of care with hundreds of providers across the country. In the rule, CMS is seeking comment on policy and operational issues surrounding the potential future expansion of this initiative. Documentation and Coding Adjustment Section 631 of the American Taxpayer Relief Act of 2012 requires CMS to recover $11 billion by 2017 to fully recoup documentation and coding overpayments related to the transition to the MS-DRGs that began in FY For FY 2016, CMS is proposing to continue the approach begun in FY 2014 by making another -0.8 percent adjustment to continue the recoupment process. Long-Term Care Hospital Prospective Payment System Changes Nationwide, most chronically ill patients are treated in acute care hospitals, but some are admitted to LTCHs. The Pathway for SGR Reform Act of 2013 directed CMS to make significant changes to the payments system for LTCHs. The law directs CMS to establish two different types of LTCH PPS payment rates depending on whether or not the patient meets certain clinical criteria: standard LTCH PPS payment rates, and new, lower site neutral LTCH PPS payment rates that are generally based on the IPPS rates. The law transitions the payment reduction for site neutral cases for the first two years of the revised LTCH PPS by requiring payment based on a 50/50 blend of the standard LTCH PPS rate and the site neutral LTCH PPS rate. In the proposed rule, CMS is proposing specifics of the implementation of this statutory requirement. 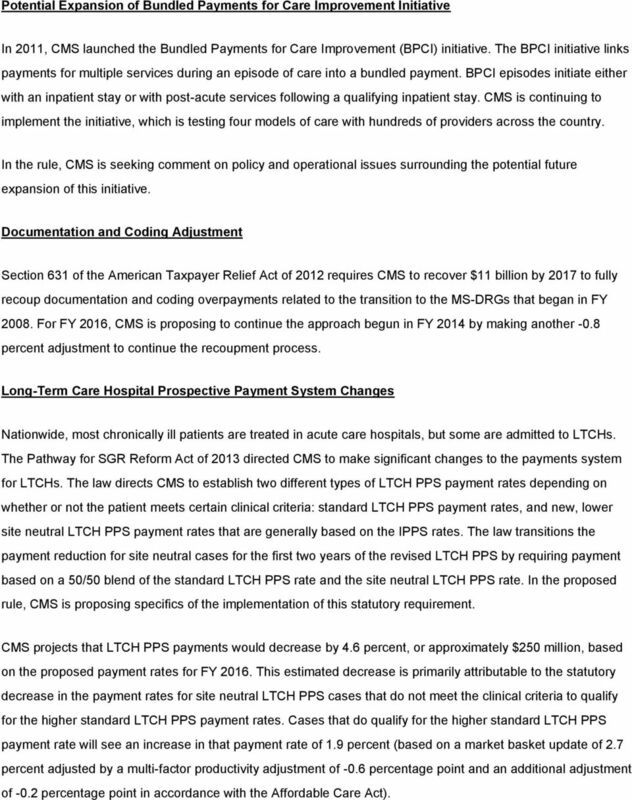 CMS projects that LTCH PPS payments would decrease by 4.6 percent, or approximately $250 million, based on the proposed payment rates for FY This estimated decrease is primarily attributable to the statutory decrease in the payment rates for site neutral LTCH PPS cases that do not meet the clinical criteria to qualify for the higher standard LTCH PPS payment rates. Cases that do qualify for the higher standard LTCH PPS payment rate will see an increase in that payment rate of 1.9 percent (based on a market basket update of 2.7 percent adjusted by a multi-factor productivity adjustment of -0.6 percentage point and an additional adjustment of -0.2 percentage point in accordance with the Affordable Care Act). 5 each hospital choosing which measures to submit, from the 28 available inpatient electronic Clinical Quality Measures. This will align the Hospital IQR Program with the Medicare Electronic Health Record Incentive Program for eligible hospitals and critical access hospitals. 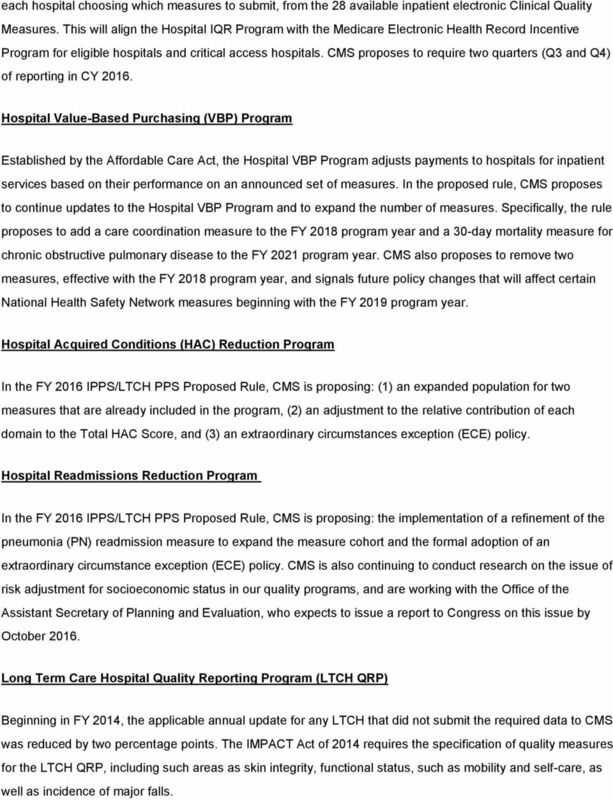 CMS proposes to require two quarters (Q3 and Q4) of reporting in CY Hospital Value-Based Purchasing (VBP) Program Established by the Affordable Care Act, the Hospital VBP Program adjusts payments to hospitals for inpatient services based on their performance on an announced set of measures. 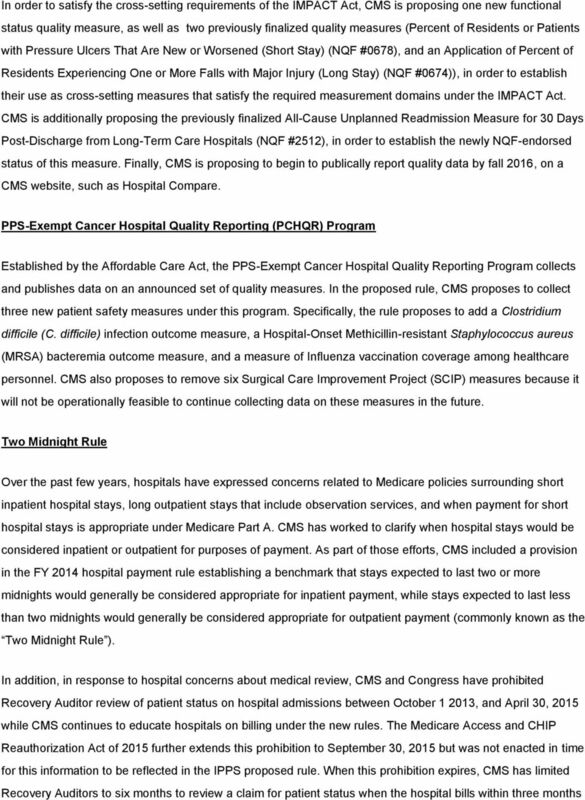 In the proposed rule, CMS proposes to continue updates to the Hospital VBP Program and to expand the number of measures. Specifically, the rule proposes to add a care coordination measure to the FY 2018 program year and a 30-day mortality measure for chronic obstructive pulmonary disease to the FY 2021 program year. CMS also proposes to remove two measures, effective with the FY 2018 program year, and signals future policy changes that will affect certain National Health Safety Network measures beginning with the FY 2019 program year. Hospital Acquired Conditions (HAC) Reduction Program In the FY 2016 IPPS/LTCH PPS Proposed Rule, CMS is proposing: (1) an expanded population for two measures that are already included in the program, (2) an adjustment to the relative contribution of each domain to the Total HAC Score, and (3) an extraordinary circumstances exception (ECE) policy. Hospital Readmissions Reduction Program In the FY 2016 IPPS/LTCH PPS Proposed Rule, CMS is proposing: the implementation of a refinement of the pneumonia (PN) readmission measure to expand the measure cohort and the formal adoption of an extraordinary circumstance exception (ECE) policy. CMS is also continuing to conduct research on the issue of risk adjustment for socioeconomic status in our quality programs, and are working with the Office of the Assistant Secretary of Planning and Evaluation, who expects to issue a report to Congress on this issue by October Long Term Care Hospital Quality Reporting Program (LTCH QRP) Beginning in FY 2014, the applicable annual update for any LTCH that did not submit the required data to CMS was reduced by two percentage points. The IMPACT Act of 2014 requires the specification of quality measures for the LTCH QRP, including such areas as skin integrity, functional status, such as mobility and self-care, as well as incidence of major falls. Linking Quality to Payment Background Our nation s health care delivery system is undergoing a major transformation as reimbursement moves from a volume-based methodology to one based on value and quality. Proposed FY 2012 Medicare-Severity Diagnosis-Related Group (MS-DRG) Documentation and Coding Adjustment. Glenn M. Hackbarth, J.D. 64275 Hunnell Road Bend, OR 97701 Dear Mr.Hackbarth: The Medicare Payment Advisory Commission (MedPAC) will vote next week on payment recommendations for fiscal year (FY) 2014. Telligen Quality Innovation Network Quality Improvement Organization. We See Where the Health Care Reform Bus is Taking Us How Do We Get On? June 12, 2015 Andrew M. Slavitt Acting Administrator Centers for Medicare and Medicaid Services Department of Health and Human Services Room 445-G, Hubert Humphrey Building 200 Independence Ave., S.W. Legislative Update Association of Medical Directors of Information Systems June 18, 2014. Answers for life. Strengthening Medicare: Better Health, Better Care, Lower Costs Efforts Will Save Nearly $120 Billion for Medicare Over Five Years. The meeting was called to order at 5:27 by the Chairman of the Executive Committee, Joseph Szot, M.D.